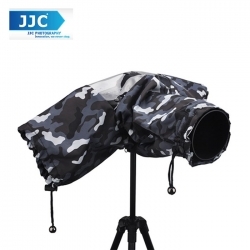 JJC RC-1 Rain Cover is designed for small SLR cameras such as Nikon D90 and Canon EOS 7D, or cameras of the same size or smaller. This sturdy and convenient camera rain cover is specifically designed to fully protect your digital camera. It allows you to keep on shooting when suddenly caught by a rain shower. You can slip the RC-1 over your camera quickly. There is access to all camera and lens controls via two side sleeves. It also comes with a transparent window that enables easy monitoring all the time. Since the camera is covered, it also protects your camera from dust and sudden drops. The full length double zipper provides bottom closure when hold the camera in hand or mount it to a tripod. The rain cover is available in black and camouflage gray. - Available in black and camouflage gray.